Director of Information & Public Relations ,DIPR Assam Recruitment 2018 | Translator Posts :- Welcome to a new job vacancy article. Director of Information & Public Relations has recently published a Recruitment notification in the month of July 2018. According to the latest DIPR Assam Recruitment 2018, Eligible and qualified candidates as per the norms stayed below arc invited to appear for a Walk in Interview (or the following posts purely on temporary and contractual basis for a very short period to meet the urgent need. 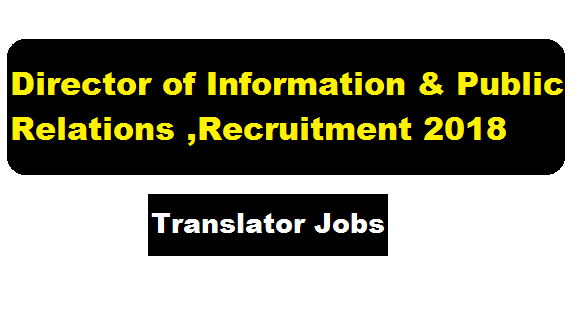 In this section, we will discuss in detail about Recruitment of Translator posts under Director of Information & Public Relations Assam Recruitment 2018 with all the details and requirement. Job Description : For Hindi Translator : Translation of any matter from Assamese. English into Hindi and Vice.Versa. Job Description : For Bengali Translator: Translation of any matter from Assamese. English into Bengali and Vice-versa. Educational Qualification: Candidates must be Graduate in any Discipline from any Govt. recognised University with Hindi/Bengali/Bodo as MIL respectively. Preference will, be given to candidate having Certificate/ Diploma in Translation Course in Hindi/Bengali/Bodo respectively from Govt. recognised institutions/organizations. Fixed remuneration: Rs 15,000/. (Rupees fifteen thousand) only per month. Interested candidates should report to the Directorate of Information and Public Relations, Assam, Dispur, Last Gate. Guwahati- 781006, along with the relevant documents in original and a act of self attested photocopies with a filled up Standard Application Form for the interview on 8th August 2018 at 9.10 A.M. Candidate should report to the venue 30 minutes before the schedule lime and to register their name in this Directorate from 9.00 A.M. to 12.00 noon. The engagement period will depend on the basis of requirement. I have a doubt that the MIL should be in graduation level or in matric level. Please clarify this .